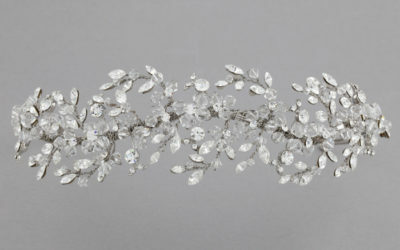 Asymmetrical band with tons and tons of clear crystals mixed with a combination of silver leaves and silver back crystals. 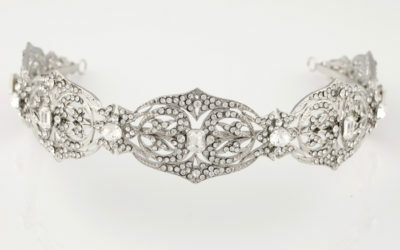 A flexible band laden with Grecian inspired vines with 3 different types of crystal. 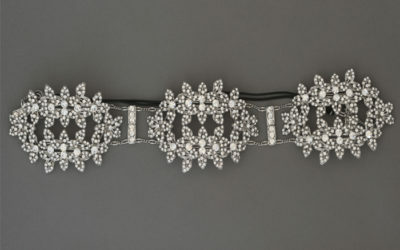 Hinged dramatic crystal headband with a variety of ways to be fastened into the hair. Most popular: Elastic with clasp. Very comfortable, yet never fails to be a head turner. 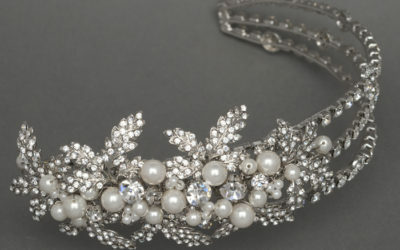 A 2 tiered tiara with bold floral accents and vines – very retro chic. 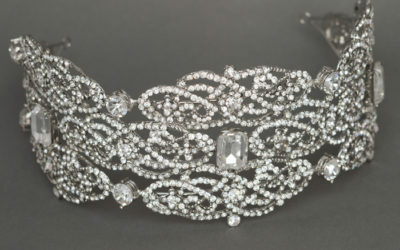 Fit only for a Queen! 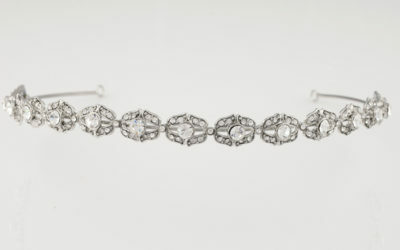 3 ½” width band of crystals that sparkle for days. Best showcased with a dramatic and very full upsweep. 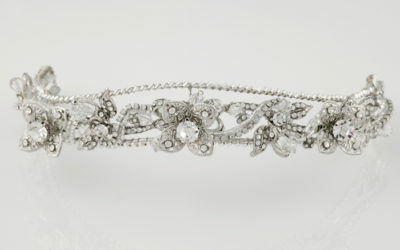 Majestic Tiara - A 2” width headband/tiara heavily influenced by Renaissance era. 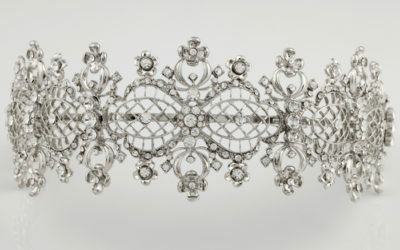 A scalloped, and regal design of pave crystals and Emerald cut crystal in the center of each scallop. 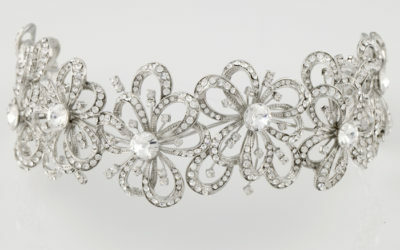 A 3 tier crystal band with a statement brooch on one side comprised of pearls and pave crystal leaves. 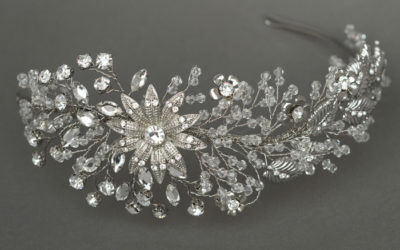 A head turning abstract floral headpiece with large Princess cut crystals and pave accents – for ultimate sparkle and statement. 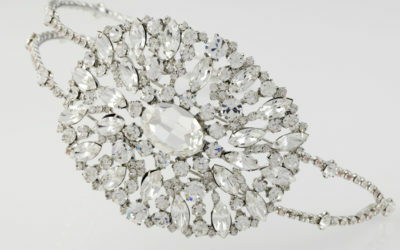 Demure, dainty and sweet – do not be deceived by the size! 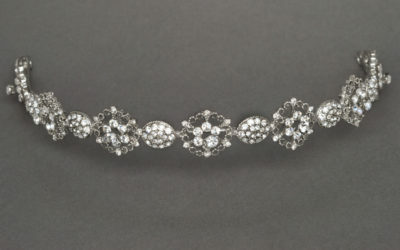 Although the headband is thin, it offers brilliant sparkle.